Maple leaf, stem, twigs, grass clippings. 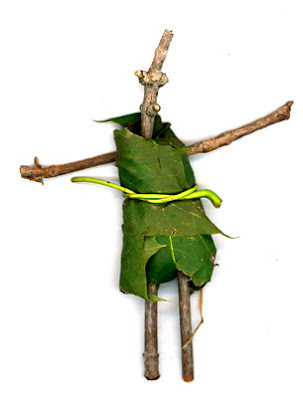 My two brothers and I used to make these in our back yard, some time back in grade school. I took it upon myself to teach my sons how to make them this past weekend, with varying levels of success. 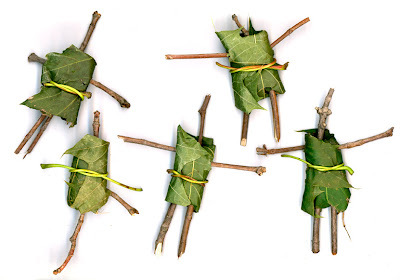 After making enough of them as youths, my fraternal collaborators and I developed something of a science to the whole process; the optimum leaf size, twig proportions, even the freshness of the grass clippings we stuffed them with. There were even a few we equipped with various weedy entrails and dandelion hearts. Then, perhaps just being boys, we did awful, torturous things to them. 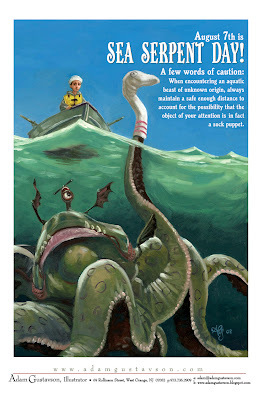 When encountering an aquatic beast of unknown origin, always maintain a safe enough distance to account for the possibility that the object of your attention is in fact a sock puppet.